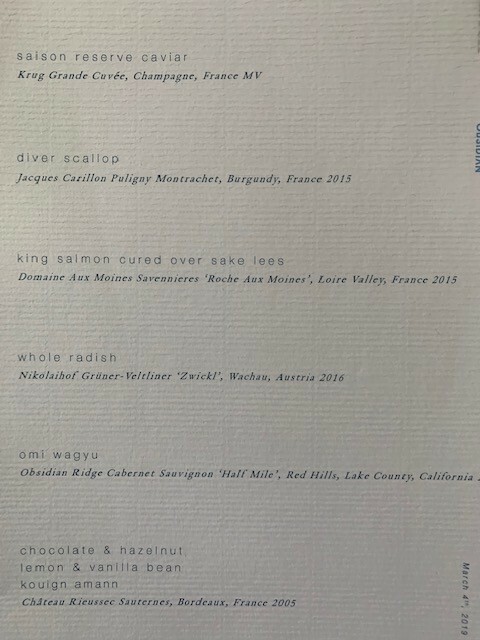 I have to admit that I haven't eaten at a lot of restaurants with 3 Michelin Stars, but the meal I had at Saison this week was the best meal I have ever eaten. The attached menu merely hints at the dishes I enjoyed, but the ecstasy in my mouth cannot be described by words. A bit of background -- I did not choose to go to Saison, rather, the invitation was thrust upon me. A well-heeled company hosted an event on a Monday evening, when Saison is normally closed. So the place was rented out for a special event, and I was one of the 30 or so lucky invitees. Last Monday night, I considered myself the luckiest man on the face of the earth, with due apologies to Lou Gehrig. The event began at the bar, with hefty pours of champagne along with lovely appetizers from the kitchen. The bites of lobster were amazing, but every mouthful was a total tastebud delight. We eventually were seated, and the menu doesn't show the amuse....it was a delicate bundle of 8 herbs with Meyer lemon zest, tied into a perfect bouquet, and served in a tea cup. Hot water was poured over, and that little cup of "tea" was exquisite. It was the perfect palate preparer for what would follow. I should mention at this point that service was precise, like a real brigade, with well informed and pleasant staff delivering each course with perfect choreography. Next came the Saison Reserve Caviar, served over a spinach and seaweed composition, accompanied by champagne. At this point, I should mention the stemware, which was delicate, balanced, and polished to a clean shine. Next came the diver scallop, which was incredible, and accompanied by a Puligny Montrachet. As lucky as I thought I was for just being in attendance, Imagine my pleasant surprise when the person seated next to me said he doesn't like scallops, so he gave me his! The next dish was the King Salmon cured over Sake Lees, and it blew me away -- easily the best salmon dish I have ever tasted. The Loire Valley "Roche Aux Moines" was a perfect accompaniment. Next came the radish dish, which I viewed as a palate cleanser. It was a bit of a salad made from every part of the radish -- tiny bulbs, leaves, stems, foam. What a surprise, and I've never seen so much goodness coaxed out of such humble bits. It paired well with the Zwickl from Austria. The grand finale of dinner was Omi Wagyu, lightly fired over the wood fire, and served with Obsidian Ridge "Half Mile" which was perfect. The Wagyu was perfect, the wine was perfect, and the meal was perfect. Dessert was served as a buffet back in the bar area, but the highlight for me was the Sauternes. This was easily the best meal I have ever eaten, and I will remember it forever.